TOKYO -- Booming North American sales and big foreign exchange gains powered surging profits at Toyota Motor Corp. in the latest quarter while propelling record full-year earnings. Operating profit jumped 46 percent to 635.7 billion yen ($5.31 billion) in the carmaker’s fiscal fourth quarter ended March 31, compared with 436.1 billion yen ($3.65 billion) a year earlier, the company said today. Net income surged by more than half to 446.4 billion yen ($3.73 billion), from 297.0 billion yen ($2.48 billion) a year earlier. Global revenue advanced 8.4 percent to 7.12 trillion yen ($59.52 billion) in the period, despite a 2.4 percent drop in global retail sales to 2.542 million vehicles. In announcing the results, President Akio Toyoda attributed the gains to cost cutting and the yen’s depreciation. But he added that Toyota is now entering a new era of expansion after taking a three-year pause on new factories. 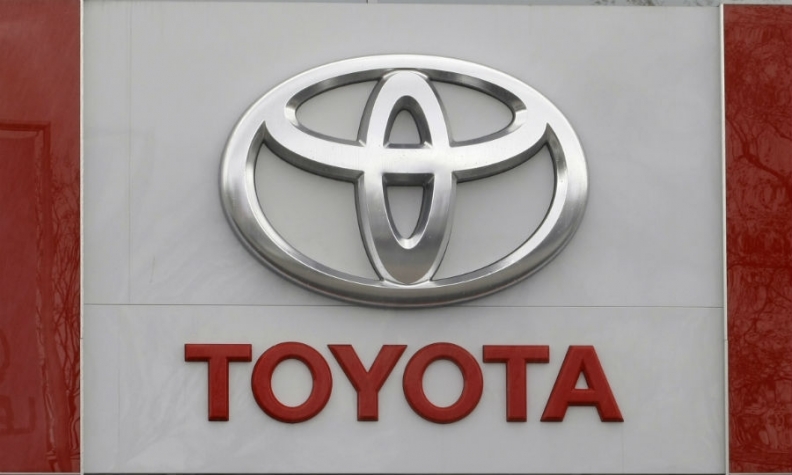 The offensive will begin in the second-half of this year with the debut of the first vehicle developed on Toyota’s new modular product platform. And it will continue through 2020 with a new factory in Mexico and new line in China. North America was a bright spot for the world’s largest automaker in the January-March quarter, with increasing sales there offsetting declines in Japan and the rest of Asia. With a range of trucks, crossovers and SUVs, Toyota was ready to catch customers shifting to less fuel-thrifty rides. Sales in the U.S., Toyota’s biggest market, advanced 7.1 percent to 607,000 vehicles in the fiscal fourth quarter. Sales in Japan fell 14 percent to 626,000 vehicles, while European volume edged 5.1 percent higher to 225,000 units in the three-month period. Rising demand for higher-margin trucks in markets such as the United States helped the bottom line. North America regional operating profit surged 72 percent to 88 billion yen ($735.6 million) in the fiscal fourth quarter, from a year earlier. Yet Japan remained the company’s main profit engine, with the weaker Japanese yen pushing regional operating profit 23 percent higher to 427.8 billion ($3.58 billion) in the quarter. Operating profit in Europe slid 3.3 percent to 14.6 billion yen ($122.0 million) in the quarter. For the full year, however, operating profit in Europe rose 39 percent to 601.4 billion euros. Toyota attributed the success to increases in European production, up 9.9 percent to 556,462, and sales, up 1.8 percent to 859,038 vehicles during its full fiscal year that ended March 31. In addition, Toyota's operating income margin in Europe during its fiscal year climbed to 2.8 percent, from 2.1 percent, as the company continued to cut costs. The robust results underscored Toyota’s sensitivity to exchange rates. Like other Japanese automakers, it has benefited over the past year from the yen’s retreat against other currencies, as the Japanese government pursues an ultra-loose monetary policy in an effort to jumpstart the country’s economy. Toyota didn’t give a breakdown of its foreign exchange gain for the fourth quarter. But for the full fiscal year ended March 31, 2015, operating profit was lifted by a 280.0 billion yen ($2.34 billion) windfall gain from the weakening yen. The result implies a fourth-quarter boost of 65 billion yen ($543.3 million), as calculated by subtracting nine-month foreign exchange gain figures previously reported at the company’s fiscal third-quarter announcement in February. The yen’s decline against the dollar and other currencies helps Japanese exports and boosts the yen-dominated value of overseas earnings. But with the yen stabilizing against the dollar, those gains are expected to dry up in the current fiscal year. For the just-ended full fiscal year, Toyota notched record results for net income, operating profit and global revenue. Net income jumped 19 percent to 2.17 trillion yen ($18.14 billion) in the 12 months ended March 31, while operating profit rose 20 percent to 2.75 trillion yen ($22.99 billion). Global revenue grew 6 percent 27.23 trillion yen ($227.62 billion) in the period, another all-time high, despite global retail unit sales hovering flat at 10.168 million vehicles. Toyota, which kept its title as the world’s biggest automaker in calendar year 2014 by selling a record 10.23 million vehicles, has surpassed pre-financial crisis sales levels. But the Japanese giant forecasts sales to stagnate at 10.15 million vehicles in the current fiscal year, on the back of slowing demand in Japan and emerging markets. For calendar year 2015, Toyota expects sales to slump 1 percent to 10.15 million. That would mark the first time sales have fallen since 2011, when Japanese automakers were broadsided by the killer Japanese earthquake and tsunami that derailed production and sales. Looking ahead to the current fiscal year ending March 31, 2016, Toyota predicts more record earnings, despite plateauing sales and a negative impact from foreign exchange rates. But the rate of earnings growth will cool dramatically. Toyota forecasts net income to grow 3.5 percent to 2.25 trillion yen ($18.81 billion) in the current fiscal year on 1.0 percent surge in revenue to 27.5 trillion yen ($229.88 billion). Operating profit is expected to advance just 1.8 percent to 2.8 trillion yen ($23.41 billion). Indeed, foreign exchange rates are actually expected to work against Toyota this fiscal year, lopping 45 billion yen ($376.2 million) off operating profit. Toyoda said there is more behind the forecasts than profit targets. His company is plowing investment into more efficient factories, a stronger workforce and better-engineered cars.